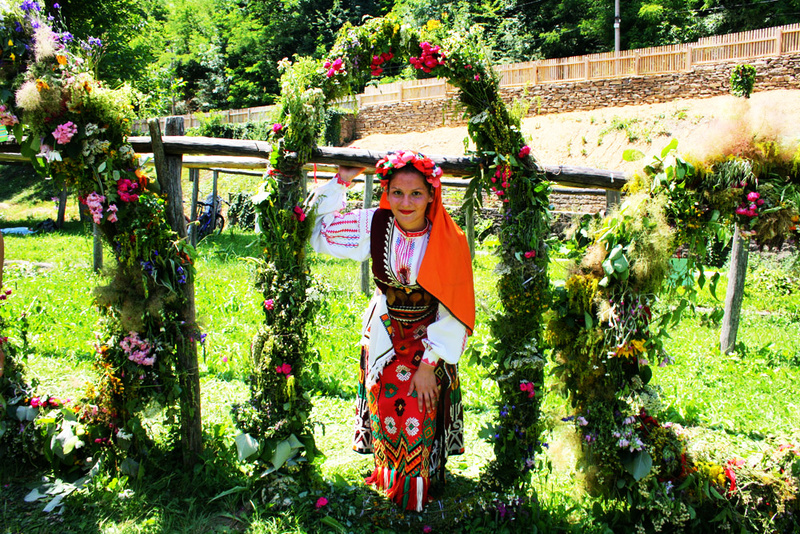 According to Bulgarian folk tradition on 24 June (more precisely on the night of 23 against 24 and June), Midsummer is celebrated. This is an old pagan holiday in honor of the summer solstice. It is also called the year of our environments, Yanevden, Ivanden Ivan Bilyober. The variety of names due to intermingling with Christian tradition, as of the same date, the Orthodox Church celebrates the birth of John the Baptist - close to Jesus Christ, who predicts his appearance and paves the way for his case. Name Day celebrate Biljana, Yvette, Iveta, Denislav, Denitsa, Dejan Dejan, Diana, Dian, Diana, Encho, Enyo, Yana Ianaki, Jane, Yanet, Yani, Yanizar, Yanizara, Yanimir, Yanimira, Ioannina, Ioannina, Yiannis , Janis, Yanislav, Yanislav, Yanita, Janica, Yanka, Janko, Iancho and names of herbs. Besides these professional holiday also have pharmacists and herbalists - heirs of the erstwhile healers. Traditional customs of Midsummer are less influenced by the image of the saint and preserved the ancient cult of the sun. The Bulgarian people believe that this longest day of the year celestial luminary ovrazgrashta all his power and then begin to slowly die. Therefore, most rituals are performed before sunrise and especially the collection of herbs that night have the healing power. Women - sorceresses, medicine woman and young girls have to raise seventy-seven herbs and a half. They heal seventy-seven diseases, only incurable disease is half herb. Who is she does not know and can find it only by closing his eyes and pluck at random. On this day of herbs make great wrists and Enjovden wreath before which must pass all health, then ritual is used to treat all year round. But the plants collected on the night of Midsummer have not only healing, but also magical powers. Struck down by an unhappy love girls can regain the joy of life with the help of gentian, tansy, kumaniga, delyanka, chernotran, wormwood and tazhets and others. These so on.. Separate herbs exempt from the devastating feeling. According to folk beliefs of 24 June sun begins to move towards winter. It is believed that before going to the long time it becomes early on, bathes in rivers and makes water curative. Then he flicked and fallen from it dew have magical powers. So it should make before sunrise to otarkalyate in dew or wash into the river, and then to face the sun, which on this day flickers. This day is connected and custom laduvane, which is implemented by "Enyova bride". This is a 3-4 year old girl last mother that the girls spread around the settlement of fertility, and his occasional stories are accepted as predictions. Finally it is the turn of divination marriage. The night before the girls threw his wrists in silent water and boiler spent the night outdoors under a rose bush. Blindfolded bride starts to pull his wrists and girls chant marriage and Wealth. In the night of Midsummer might get lucky and seeking treasure. According to legend there where buried gold, light blue flame. These otherwise guarded by goblins gold pieces at this point can be taken safely.